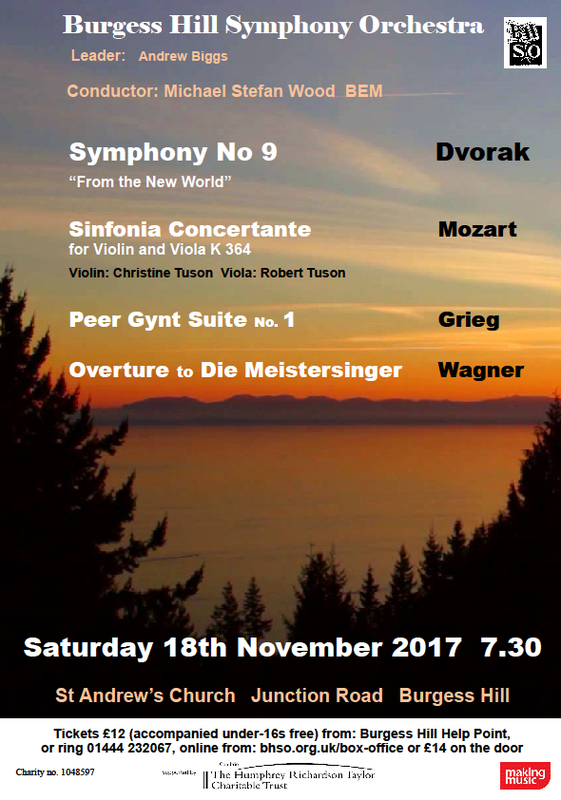 On Saturday 18th Nov 2017 at 7:30pm Burgess Hill Symphony Orchestra presented their Autumn Concert at St. Andrew’s Church, Junction Road, Burgess Hill, RH15 0LG. Our Autumn concert this year has a European flavour. Wagner’s majestic overture to Die Meistersinger von Nurnberg opens the programme. Dvorak’s ever-popular New World Symphony offers the old world’s take on the new. Grieg’s Peer Gynt Suite includes the well known “Morning Mood” and the “In the Hall of the Mountain King”. We welcome soloists Christine Tuson and Robert Tuson for their interpretation of Mozart’s Sinfonia Concertante.